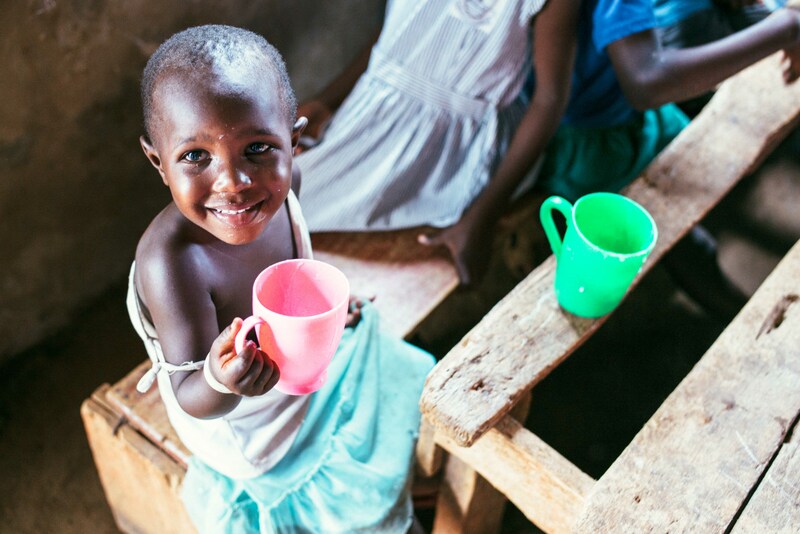 Photo: This child in the Katoogo slum colony of Kampala, Uganda, is thankful to receive breakfast and lunch as a Kindergarten student at our Children’s Hope Center. In the midst of this depressing squalor stands the Children’s Hope Center, an education and nutrition outreach of Peace Gospel International. In partnership with our Kampala field director and his team, we started the center as an after-school care program, but a few years ago we transformed it into a fully-operational primary school, offering a Kindergarten through 7th grade education, with 200 students currently enrolled who are studying a complete curriculum with subjects such as English, physical education, mathematics, science, reading, and social studies taught by 8 qualified, salaried teachers. We have faced several challenges at the school, mostly from damage caused to the humble facility during severe flash floods. As the colony is at the base of the Gaba hills approaching Lake Victoria, the area is extremely flood prone. With your support, we are seeking to raise $5,000 to raise the floor level of the Hope Center school to prevent future flooding, add additional classroom space, and buy new desks to replace old desks that were damaged during previous flooding. Photo inset: (Top-left): Our Children’s Hope Center in the slums of Kampala, Uganda, offers a Kindergarten through 7th grade education, with 200 students currently enrolled. (Top-right): Our school’s hardworking team serves breakfast and lunch to 200 students 5 days a week. (Bottom-left): We hope to break the vicious cycle of extreme poverty for this child in the Katoogo slum colony of Kampala, Uganda, through education and nutrition support. 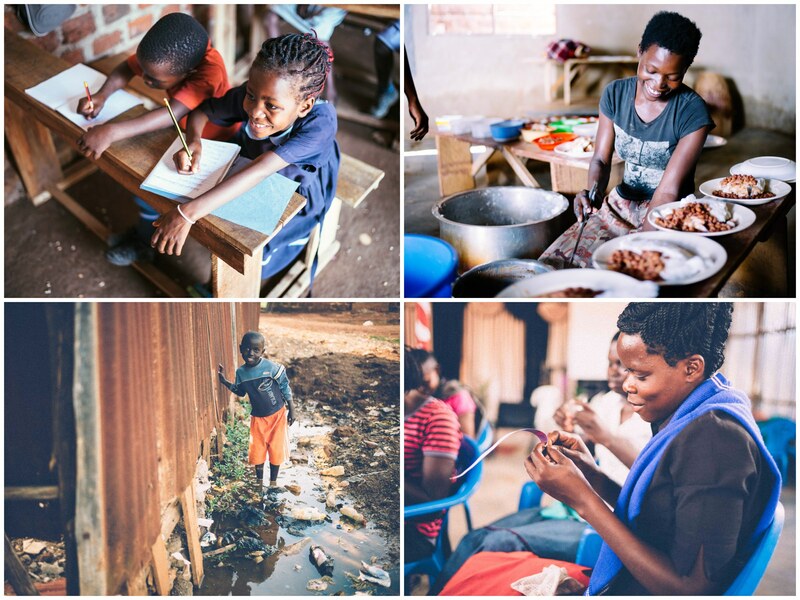 (Bottom-right): We just launched our Kampala ‘She Has Hope’ rehabilitation home where 4 girls are enrolled, learning how to make paper beads which will be used to make necklaces, bracelets, and clutch purses. During the second day of Kirby’s trip, he revisited the resilient people of the Katoogo slum colony and our Children’s Hope Center located there. He observed breakfast and lunch being served to our 200 students, which is a great accomplishment for our school’s team every day. However, Uganda is also dealing with a food crisis which began 8 months ago when the country suffered an intense drought. As a result, food prices have doubled in price due to food shortages in the area. Kirby witnessed several children who lined up outside our Hope Center with bowls, hoping to get leftovers from lunch. He reports, “Thankfully we had enough to serve most, but we lack the budget to keep the pantry stocked with adequate supplies of rice, cornmeal, and beans, which are all staples of the local diet.” Each month we seek to raise $500 to feed 200 students breakfast and lunch 5 days a week. However, with the recent food crisis, our food costs have nearly doubled. In happier news, Kirby also visited our new Kampala ‘She Has Hope‘ rehabilitation home which recently launched, being modeled after our Kathmandu, Nepal, rehabilitation home, both of which empower the girls to recover from the trauma of human trafficking. Four girls are currently enrolled at the new home in Kampala and as part of their skill development coursework they are learning to make paper beads of several varieties, which will be used to make necklaces, bracelets, and clutch purses to be sold online in our ‘She Has Hope’ crafts shop where all proceeds go towards their rehabilitation. We are also planning to offer the girls gardening, cooking, and literacy classes soon. Our goal is to equip them with all the skills they need to enter the workforce as empowered citizens, fully realizing their potential, restoring them to a life full of hope. The Kampala rehabilitation home is currently located at our field director’s residence, but we are planning to move the girls to their own nearby rental home. We are seeking to raise $1,500 to meet the most prominent needs for this move such as bedding and furniture, kitchen supplies, and the first year’s rent. Please keep all of these dear people and our endeavors to help them in your prayers. We are so thankful for your support, enriching the lives of our children, our girls, and our native team physically, spiritually, and emotionally.